Michaelangella Arpino was the sister of Francesca Arpino who married Augusto Quilietti. I would like to thank the family of Nader Afshari who contacted Helen regarding some inaccuracies on the website about this branch of the family. He is a direct descendant of Michaelangella Arpino. Thanking him and his mum and sister for sending on much of this information. Also the link to the Fusco Family website where much of the contents of this page were found and Alanna who has built this information about the Fusco Family History. I know through my own experiences that it is through trying to build on your information that you find out so much more. Francesca Arpino Quilietti with Augusto Quilietti and their daughter Angelina. She was the youngest of the Arpino\Cascarino children and the sister of Michaelangela. Francesca’s parents both died in Scotland, Her mum age 80 in Roslin in Scotland and her father age 80 in Edinburgh. 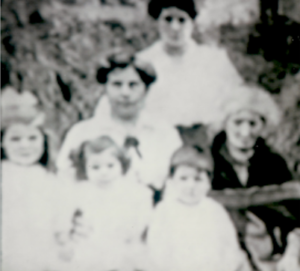 Four Generations of Arpino with old Granny Benedetta, her daughter Francesca Arpino Quilietti, her daughter Angelina Quilietti Arpino and three of Angelina’s children. It is old and blurred but Helen saw the original in the home of Mary Arpino who is the eldest daughter here on the left. It was in the 1990s. Since Mary died have been trying to find a better copy for the website. In Italy Michaelangella met her soon to be husband Benedetto Fusco, who was 9 years her senior. Benedetto was born in 1849 in Italy. His father was Pasquale Fusco whose occupation was given as a ‘wood turner’ and his mother’s name was Celeste D’Agostino. They were from the same district in Italy as the Arpino family. Before their marriage, their first daughter, Maria Maddalena was born in Sant’Elia in 1879. Very shortly after, Benedetto, Michaelangella, and their new daughter (potentially accompanied by Michaelangela’s extended family) moved to the UK, and were soon married in Bradford, Yorkshire. Benedetto and Michaelangella then settled in Bradford, where they would remain for the births of their next eight children. 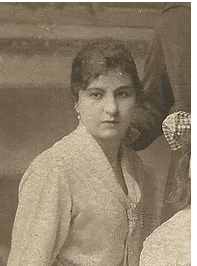 Their second child, Annunziata, was born on the 2nd June 1880. Shortly after her birth, the family can be found living in a lodging house on Paper Hall Court in the East End of Bradford. The lodging house was owned by another Italian – Giuseppe Bacigalupo – and in 1881 it housed many Italian immigrants. It is not clear how long the family remained at this property, but Michaelangela’s next 8 children were born during their time in Bradford followed on by another three in Edinburgh Scotland. By the 1911 census, Michaelangella, Benedetto and five of their children had moved to 37 Candlemaker Row. Their eldest daughter, Maria Maddalena, was living in a flat in the same building with her own family. Throughout her time in the UK, Michaelangella was referred to interchangeably as ‘Michaelangella’, ‘Margaret’, and ‘Maggie’. In 1920, Michaelangella was convicted of having kept her flat at 37 Candlemaker Row as a gambling house. She was given a £20 fine, with the alternative of 60 days in prison. Maria married on 27th August 1900, to a man by the name of Marco Joseph Gargaro, a tile layer and marble cutter. He was 19, and she was 21. Together, they had eight children. 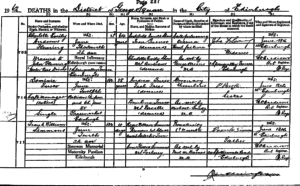 The 1911 Scottish census sees the family living at 37 Candelmaker Row in Edinburgh. 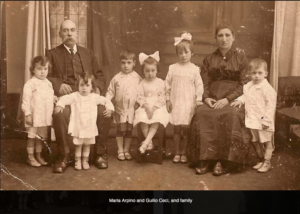 MARCO was not mentioned in the census and must have been away at work, but their surviving children Antonio born 1901, Maria Maddelena born 31 August 1902, Pasquale Gargaro born 1905, Phyllis Josephine Gargaro born 28th January 1907, Carmina Gargaro born 17th February 1909, Louisa Gargaro born March 1911. Joseph born 4 May 1913.Michael Gargaro January 1904, but he only survived 2 days . The Gargaro family still live in the Edinburgh district to date 2018. 2. Nunziata Lucy ‘Lucyanna’ Fusco – The Russo and Cairo connection. 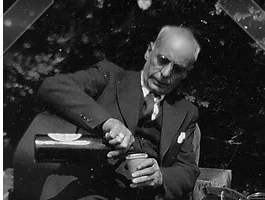 Nunziata was born on 2nd June 1880 in Bradford, Yorkshire. She was the second child of Benedetto Fusco, aged 30, and Michelangella Arpino, aged 21. Until she was 14 she remained in Bradford with her family until they moved to Edinburgh. Here, aged 15 she married Alexandero Russo who was 17 years her senior and working in the Scottish Capital as a confectioner. Nunziata and Alexandero ceased living together on 26 June 1906. At this time, Nunziata was pregnant by another man. This man was Giuseppi Leopold Caira, a restauranteur two years her junior. Their first daughter, Loreta, was born on 26th December 1906. She was followed by another daughter, Santella, on 25th September 1909. Their final child, Michel Antony, was born on 13th September 1915. 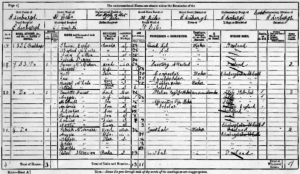 Throughout this time, it appears Nunziata and Giuseppi were living together, and she is recorded in the 1911 census as his wife. However, they remained unmarried, and Nunziata continued to use the name “Lucyanna Russo” , though she claimed to have had no contact with her husband Alexandero since they ceased living together. Nunziata and Alexandero finally divorced on 26th February 1921, and just a month later, on 24th March 1921, she married Giuseppi. Giuseppi sadly passed away 13 years later in 1934, at the age of 52. Nunziata herself died on 1st October 1954, at 72 Glenvarnoch Drive in Edinburgh. She was 74 years old, and had suffered cardiac failure. She is also recorded as suffering from spleen cancer, and osteoarthritis of the spine. Andrea was born in June 1882 in Bradford. He moved to Edinburgh with his family from Bradford circa 1896. 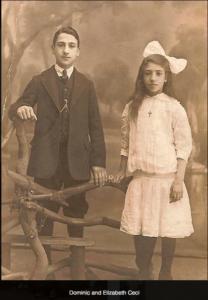 Andrea travelled to his father’s home town in Italy – Villa Latina, and it was here, back in the old Country, that Andrea met a woman named Bambina Pacitti, whom he married on 5th March 1903 in Villa Latina. . Their first child, Domenico, was born in 1905. Their second son Pietro Orazio was born on March 1st at 9 Cowgate in Edinburgh. Their third child was a daughter, Michaelangela or Filomena, who was born on June 12th 1908 at 31 Candlemaker’s Row in old Edinburgh. In 1910 the family moved to the USA where they settled in Detroit in Michigan. Andrea’s parents joined them when they married in Detroit in the year 1918. Andrea was a Joiner or Carpenter as they are called in America by trade. 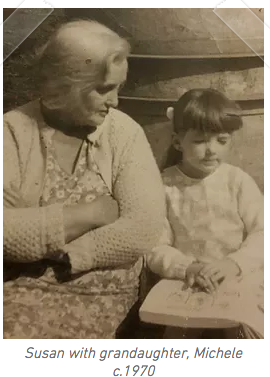 Bambina and her two children left the US in 1922, then moving to Edinburgh, where they lived in a house owned by Andrea’s mother at 37 Candlemaker Row. Andrea is not recorded as making this journey with them. However, he may have followed soon after. Bambina sadly died in 1938, leaving Andrea a widower with two grown up children, When Andrea himself died in 1955, he was back in Edinburgh, indicating that at some point he did rejoin his family. Domenic Fusco, their son, died in Edinburgh at 25 Grassmarket on June 12th 1962. On this document Andrea was described as a Fish Fryer so perhaps on his return to Scotland he started in a new very lucrative venture in the restaurant business. 4. GIOVANNA or JOANNA FUSCO – the RINALDI connections. Giovanna was born in around March 1884 in Bradford, England. Her father, Benedetto, was 35, and her mother, Michaelangela, was 25. The family moved from Bradford to Edinburgh when Giovanna would have been around 12 years old. In Edinburgh at this time and where the family lived there was a Roman Catholic Church called St. Patrick’s in the Cowgate. It was here on 2nd October 1902 that she met another Italian immigrant called Gerardo Rinaldi. They married in St. Pat’s on 2nd October 1902. 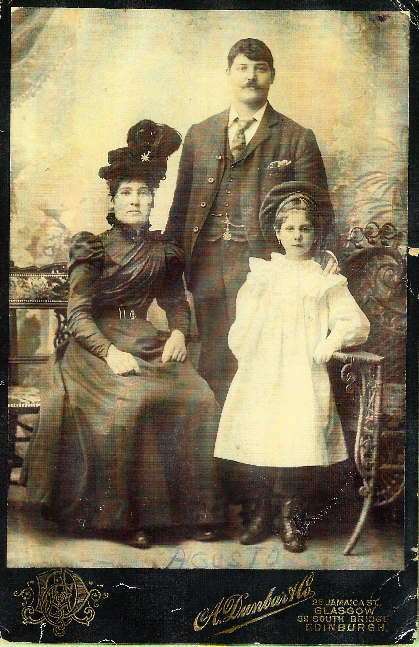 The Rinaldi family were living through the West in Cambuslang at the time of their marriage. Gerardo’s parents were Bieggio Rinaldi, Confectioner and Benedetta Lamarra. In 1903, shortly after their marriage, her new husband made his first journey to the US. Giovanni followed in 1909. The couple had seven children, Giovanni born 30th April 1905 in Buckhaven in Scotland. Concetta or Rosie who was born in Villa Latina in 1906. The rest of the children were born in Wayne, Michigan, USA where the family settled for many years. Mary was born 1910, Dominic born 1912, Louise, born 1914, Pansy born 1915 and Susie born 1918. Giovanna sadly died in 1920. Michell was born in Sant’ Elia in the year 1885. ​It would have been likely that his parents had returned on a family visit or to take some hard earned cash back to family in Italy at the time. Michell moved to Edinburgh circa 1895 when he was around 10 years old. On 2nd August 1909, Michell married a Scottish woman by the name of Elizabeth Buchanan. He was 23, and she was 21. They were married in Glasgow. Their first child, Andrew Bennet, was born on 5th June 1910. He was followed by a daughter, Janet, on 1st August 1911. Some time between 1911 and 1918, Michell and his new family moved from Glasgow to the US. They are next found in Manhattan, New York, on 22nd October 1918, when their son Andrew sadly died at the age of just 8 years old.Michell remained in the US until his death on the 26th December 1938, at 513 East 85th Street, Manhattan, which is situated in Roosevelt Island, Manhatten . He was a mechanic by trade. GIUSEPPE was born around October 1877 in Bradford, the sixth child of Benedetto and Michaelangella. ​ Little is known about Giuseppi until 20th October 1921, when he was arrested and fined £1 (with the alternative of 10 days imprisonment), for being found in a gambling house with his brother Salvatore, his sister-in-law’s brother Michael Pacitti, and his uncle, Giuseppi Arpino, who was also known as being a bit of a lad. Giuseppe was a general labourer by trade. He died young on 14th June 1943, having never married. Antonio ‘Tony’ Fusco was born in around January 1890, in Halifax, Yorkshire. His father, Benedetto, was 40, and his mother, Michaelangella, was 31. He also came to Edinburgh with the family and found employment in the Italian restaurants belonging to many of his countrymen as a Waiter. Here he met Emily Kelly who was 3 years his junior. They married on 3rd November 1914. Emily unfortunately died two years later. They had no children. Tony remarried later in 1926 to Mary Ann Weir. They never had any children. He later worked on the tramways in Ediburgh as a tramway Labourer. Tony died in Edinburgh on 6th March 1945. 8. SALVATORE, or SAM FUSCO – The Morrison connections. Salvatore, or Sam as he was known was born around 1893 in Bradford. Like his siblings moved to Edinburgh with his family. Unlike his siblings, Sam’s profession was one of Hairdresser. Some time in or before 1919, Sam met Wilhelmina Neilson Morrison, whose father was a Shoemaker, and the couple married on 16th June 1919. They married at 5 Greyfriar’s Place in Edinburgh in presence of his brother Joseph Fusco who was described as a serving soldier at the time, who would have been his ‘best man’ and Netty Fusco, his sister as the Maid of Honour. The marriage however was signed by the Sheriff Substitute of Lothian and Peebles, so it was a registered official wedding. At this time, just after the 1st WW this was a regular occurance in Scotland. Their children were Bennett born 13th October 1919 in Newport Street, Edinburgh. Bennett died on 13th April 1991. Bennett married Jane Finnan and their son Ronald George was well known to the author’s husband Denis Madigan Stanton. They enjoyed football together and played in the same youth teams. Ronnie progressed as a Referee. Ronny’s wife Helen Madigan Fee also knew Helen Quilietti Stanton and worked with her for a few years. Ronnie died in 2011. Their other children were Loretta Fusco born 1921, Ralph 1923-1946, George 1925-1988 , Louise Fusco who married John Callahan. She was born 1928-2004. ​Over time, Salvatore developed a drinking habit and in 1935 was arrested for assaulting his wife and the arresting police constable after returning home drunk. 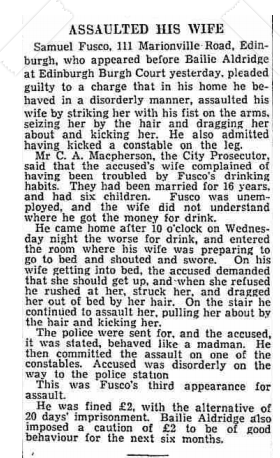 According to the The Scotsman, this was his third appearance for assault. He was fined £2, and cautioned to be of good behaviour for the next six months.At this time, he was unemployed. However, this was not unusual for the mid-1930s, as Britain entered a large economic depression. Salvatore died 2nd February 1959 age 66. The Depression had a lot to answer for as is testament to Salvatore’s severe depression. Maria Louisa was born in March 1894 in Bradford. As before the family arrived in Scotland circa 1896. Little is known about Maria Louisa for the next two decades. However, some time in or before 1921, Maria’s brother, Pasquale, met a woman named Susan Bird, who would later become his wife. Maria was, at some point, introduced to Susan’s widowed father, John Bird. Maria Louisa and John married on 17th July 1931. He was 55 and she was 37 (just 8 years older than her new step-daughter and sister-in-law, Susan). Maria Louisa became known as ‘Auntie Louisa’. The couple had no children of their own. Maria Louisa died in 1972, at the age of 78. Pasquale Fusco was born in Bradford in June 1895. He moved to Edinburgh with his parents and siblings circa 1896. It was in Edinburgh that Pasquale met a lady by the name of Susan Bird, who was born in 1902. 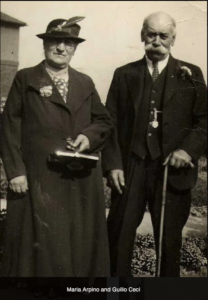 They fell in love and eventually married on 20th March 1922 at the Church of the Sacret Heart which is situated just off the West Port in Edinburgh’s old Town off the Grassmarket. Pasquale’s aunt Francesca had also married here some years earlier It was a Roman Catholic Church to which many of the Italian community had worshipped throughout the decades. Witnesses were Antonio D’Ambrosia and Jessie Bird. At the time they were married, both Susan and Pasquale were living at 6 Herriot Bridge in the Grassmarket. He was 26 and she was 19. Susan ‘Susie’ Bird was born on 19th October 1902 in Edinburgh, Scotland. Her father, John, was 26 years old, and her mother, Mary, was 23 years old. She was preceded by her sister, Jessie, and brother John, then came along Annie. In 1911, when Susan was just 8 years old, her mother sadly passed away at the young age of 32. She had been suffering from pulmonary phthisis (now recognised as a type of Tuberculosis). ​Some time in or before 1920, Susan met Pasquale Fusco, while she was working as a chocolate coverer. On 10th January 1921 their first daughter, Johanna, was born. She was followed a year later by another daughter, Celesta, on 5th January 1922. However, it was not until 17th March 1922 that Susan and Pasquale were married. Despite the existence of two illegitimate daughters, they were married in the Church of the Sacred Heart, according to the forms of the Roman Catholic Church. At the time they were married, both Susan and Pasquale were living at 6 Herriot Bridge in the Grassmarket. She was 19 and he was 26. At some point, Susan’s father, John, was introduced to Pasquale’s sister, Maria Louisa. The pair married in 1931, when John was 55 and Maria Louisa was 37 (just 8 years older than Susan). ​Susan and Pasquale’s third and final daughter, Michaelangela, was born on 2nd February 1933. Susan remained in Edinburgh for the rest of her life, and remained significantly involved in the lives of her children and grandchildren. She passed away in February 1995. ​Patrick or Paddy as he was known by his family and Susan had in total ten children, of which there were three surviving daughters, Johanna Fusco born 10th January 1921, Celesta Fusco born 5th January 1922 and Michaelangela Fusco who came along on 2nd February 1933. The long years in-between the ages of the three sisters reflects the years where Susan had lost seven children and must have been a very painful few years for all involved. Paddy died in October 1953 from a perforated gastric Ulcer. Susan never remarried and remained in the family home for many years. In later life she moved to a nearby flat. Their surving children – Johanna Fusco went on to marry William McLay and they had three children. Celesta Fusco married Thomas McNamara and they had ten children. Michaelangela Fusco married Thomas Gordon. Thomas worked as a slaughterman. Michaelangela and Thomas in turn had four children, Anthony Gordon, Yasmin Celesta Gordon , Susan Michele Gordon [who died at birth] and Michaelangela Maria Gordon. It is Yasmin’s family who at first had been in touch with Helen to update this page. Nader tells us of the times that he and his siblings would be looked after by their grandmother Susan when they came home from School. He describes her as an AMAZING WOMAN. Yasmin Celesta Gordon married Afshari Nadar who was studying languages in Edinburgh during the 1970s. Yasmin was a Clerkess and Afshari a Student of English at the time of their marriage on December 16th 1977. Afshari’s home country was Iran although now he lives in Edinburgh. Antonia Fusco has a look of Arpino in her – looking a lot like her Aunt Francesca above. Antonia Fusco was born on 1st June 1897 in Edinnburgh. She was the first of her siblings to be born in the Scottish Capital. Another 3 siblings followed her. These were Giacintto (born 1899), Giacintto (born 1901), and Razio (born 1903) . 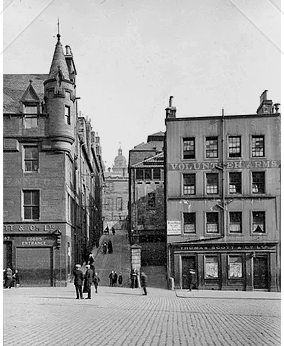 In 1925, at the age of 27, Antonia married Thomas Christopher Norval Cairns Watt at 34 Chambers Street in Edinburgh where there was a Registrar’s Office at this time. ​ This line still has to be traced but we do know that Antonia died on 7th November 1964 of heart failure. 12. GIACINTTO FUSCO Giacintto Fusco was born in Edinburgh on 7th April 1899. He suffered bad health and unfortunately died prematurely at 11 months of age in the family home of bronchopneumonia. Razio “Richard” Fusco was born in Edinburgh, Scotland on 8th March 1903. The youngest child of Benedetto, who was 52, and Michaelangella, who was 44, he was preceeded by 13 siblings. These were: Maria Maddalena, Nunziata, Andrea, Giovanna, Michell, Giuseppi, Antonio, Salvatore, Pasquale, Antonia, Giacintto, and Giacintto. Little is known about Razio’s early years. However, it appears that at some point he changed his name to Richard, and is listed as such on his marriage, divorce, and death certificates. Razio, now going by the name ‘Richard’, married Margaret Docherty on 12 November 1923. Together, they had one son, Patrick, who was born three years later, in 1926. Razio and Margaret divorced on 14th June 1932, when their son was 5 years old. Patrick would grow up as ‘Patrick Docherty Fusco’. Razio died on 25 November 1966, at the age of 63. The Fusco/Arpino Clan is large and have many social interactions, it is therefore easy to get mixed up with lines along the way as many cousins marry cousins and have same forefathers. MARIA GIUSEPPA ARPINO was the sister of Michaelangella and Francesca Arpino. She married into the Ceci Clan whose family originated from the same region in Lazio as both the Fuscos and the Arpinos. Maria Giuseppa Arpino was born in Italy in around 1866. She was the third child and second daughter of Benedetto Arpino, aged 33, and Benedetta Francata Cascarino, aged 27. She was preceeded by a sister, Michaelangella, who was 7 at the time of Maria’s birth. Their brother, Nicolo, was 4. Maria was the third of five siblings, and was succeeded by another brother, Giuseppi, in 1870, and a sister, Francesca, in 1873. ​Little is known about Maria over the course of the next decade. However, it is likely that she and her family moved to Bradford, England, around the time of her sister Michaelangella’s marriage, in 1879. This is where Maria is next found, on her marriage certificate in 1884. The Ceci Clan with their stepping stones. Maria with her hubby Guilio Ceci. On 28th August 1884, Maria married a man by the name of Guilio Ceci who was from the same region of Italy as the Arpinos. She was 18 years old; he was 30 and a musician, like her father. At the time of their wedding, Guilio was living in a lodging house in Paper Hall Court – the same lodging house where Maria’s sister Michaelangella had been living a few years earlier. ​Annie (born c.July 1885), Giuseppa born and died 1887, Mary Jane born 2nd June 1888. Angelina born 1890,Samuel born October 1892, Vincent born 1896, Giovanna born December 1897, Joseph born 1899, Dominic born 1900 and Elizabeth born 1903.Her eldest son, Samuel, sadly died at the age of 22 while he was serving in the military. Maria was still living in Bradford at this time. Maria remained in Bradford for the rest of her life, although her parents and siblings moved to Edinburgh. Maria died in Bradford on 19th February 1960. I find it fascinating that the facts for pasquale Fusco and Susan Bird are in fact wrong. These are me maternal grandparents. It was lovely to hear from my cousin Nader, that my website has been of us in updating this site! 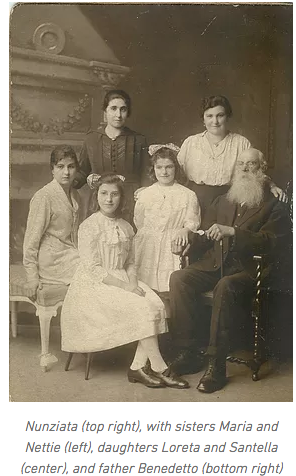 I am a descendant of Michaelangella through her son, Pasquale (my great-grandfather), and this website was one of the things that incited me to start researching the family! I am a great-great-grandson of Michelangela Fusco through my late nana, Antonia “Netta” Fusco (named after her own aunt), youngest daughter of Salvatore Fusco. Incidentally Aunty Molly (Loretta) passed away last month at the grand old age of 96. I have done a fair bit of research into my family tree and you should have access to my tree (with various photographs) on Ancestry. If I can fill in any gaps, please let me know.